The Graduate Specialization in Automotive Systems and Mobility (GS-ASM) provides a unique opportunity for the MS and PhD students in the Department of Mechanical and Aerospace Engineering to acquire specialized training, unique skills and real-world experience in their area of interest, which will enhance their degree with a focus on automotive systems and smart mobility. Students wishing to partake in the GS ASM program are required to gain admission through the graduate program in the Department of Mechanical and Aerospace Engineering. Because departmental requirements for the master’s degree vary (e.g. thesis and non-thesis options), students are expected to prepare and implement a study plan that satisfies requirements for both their their home department and the GS ASM program. Each student will formulate a plan with the assistance of his/her advisor, and upon its completion, submit it to his/her home department’s Graduate Studies Committee. Depending on whether they are completing the thesis or non-thesis option, students fulfill the requirements of their selected focus area by completing one or two sequences of core courses. 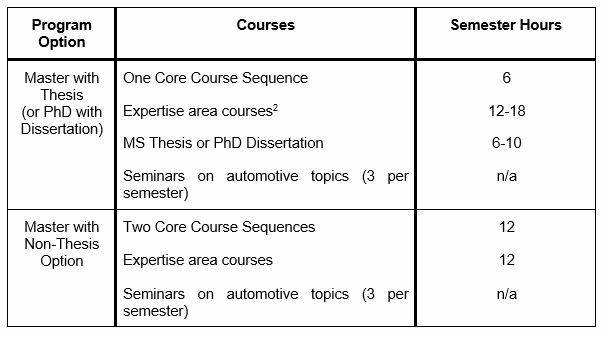 For more information on what constitutes a sequence, please refer to the Core Course Sequence Requirements chart (Table 1) section below. After completing their core sequence, students enroll in a number of interdisciplinary courses that relate to their specified area of expertise. Generally, relevant courses on mathematics, statistics and computational methods qualify as expertise area courses. Thesis option students are required to take one core sequence. It is expected that their thesis be on a topic related to automotive systems. Non-thesis option students (master’s only) are required to take two core sequences. In addition to the core sequence(s), students fill out the coursework portion of their degree requirements with an expertise area course, some of which should be drawn from the core focus area courses. A partial list of suggested expertise area courses is linked here, with the exemption of available math courses that are excluded due to their large number. All students are required to regularly attend seminars on automotive systems topics, which are held weekly at the Center for Automotive Research when classes are in session at the university. To complete a core sequence, a student must select two semester courses from one of the core focus areas listed here. Under special circumstances—providing that the intent of the core sequence is preserved—students may substitute one of the core courses in a sequence. In the cases where prerequisites for core courses may not be waived, students should take the prerequisite course for credit and use these courses to satisfy other requirements posed by their graduate program. Core sequences consist of subject matter that is crucial to form a comprehensive understanding of at least one important area in automotive systems. Additionally, the focus of each sequence aligns with the research specializations at the Center for Automotive Research. In addition to the core sequences listed above, each GS ASM student is required to take at least 21 credit hours (dependent upon departmental requirements) of expertise area coursework, at least three hours of which must be drawn from the list of core focus areas. A partial list of expertise area courses is linked here. Because courses not listed herein may qualify as expertise area courses (such as most mathematics courses available for graduate credit), the student must work out a plan with his/her advisor, and submit to the home department’s Graduate Studies Committee for approval (see below). All students participating in the GS ASM program are required to regularly attend seminars that focus on automotive systems topics. These seminars will feature a range of speakers and themes, and industry experts are often invited to share their insight with students as well. Generally, seminars focus on current work in automotive-related research, conveyed from the perspectives of practicing automotive engineers and managers. Regardless of whether a GS ASM student is completing a master’s thesis or doctoral dissertation, it is required that the final research product is relevant to automotive systems. The GS ASM requirements serve to enhance the skills and knowledge that graduate engineers will apply to complex automotive problems in the future. 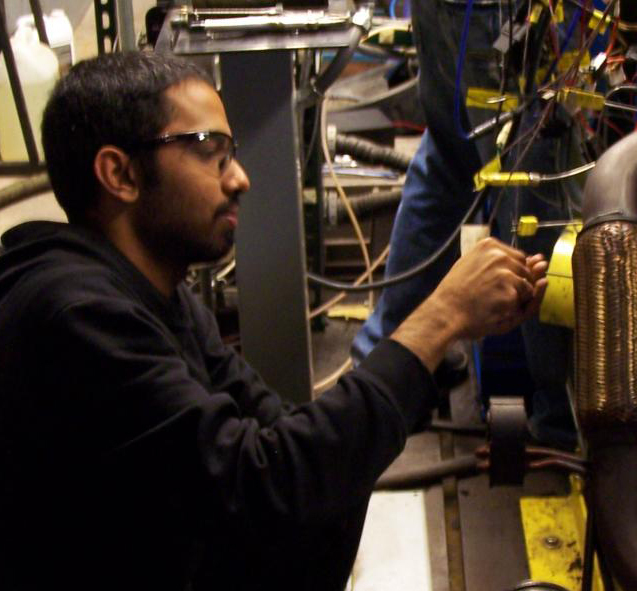 By their program’s completion, students will better understand the perspectives, capabilities and approaches of other engineering disciplines, as well as their relevance to automotive systems. Interested students can apply to the GS-ASM by completing the online application. The GS-ASM program administrator at CAR will check that the courses identified by the student satisfy the GS-ASM requirements and will inform the student of acceptance into the program. During the specialization program, students are required to take a number of required Advanced Automotive Systems Seminars. Upon taking each seminar, students will be required to fill in an online questionnaire, available on the CAR website. This will allow the program administrator to track the progress of the student in fulfilling the attendance at the required seminars. Before the first Friday of the semester of graduation, the student will request the GS-ASM at gradforms.osu.edu. The program administrator at CAR will verify whether the student has completed the requirements of the GS-ASM, and notify the MAE Advising Office. Upon receiving notification from CAR, MAE will inform the Graduate School, who will issue the "Graduate Specialization in Automotive Systems and Mobility" on the student’s transcript. The GS ASM program is administered by the Graduate Studies Committees of the Department of Mechanical and Aerospace Engineering. "My time in the program gave me exposure to working with a major automotive manufacturer. I gained valuable experience with system modeling, model-based control development, testing and more. My experience at CAR put me in a position to get multiple offers from desirable companies because I had the skills they needed to produce results from day one! The Automotive Systems Engineering program is ideal for any student wanting to acquire skills that companies are looking for."